NOT A STAND ALONE GAME! Requires one copy of Memoir '44 and the Operation Overlord expansion, or two full copies of Memoir '44. The third installment in our series of Memoir '44 Battle Maps includes 2 Overlord scenarios; 2 Standard scenarios; new Summary cards for the previously published Battle Maps and Mediterranean Theater expansion; and, for the first time, additional cards for in-game play - the new Combat Deck specifically designed for urban warfare. By the end of August 1942, German troops had reached the Volga, north of Stalingrad. In a matter of days, 4th Panzer Army, headed for the river south of the city, effectively trapping many of the men and women of the Soviet 62nd Army. Stalin's order of July 27 - "Not a step back!" - was no longer just an obligation but a necessity, and its slogan "There is no land behind the Volga!" the harsh reality that now faced all of the city's inhabitants. Having witnessed first-hand on the Russian steppe the devastating effectiveness of German Blitzkrieg tactics, Lt. General Chuikov turned the carpet-bombing of the city to his advantage. Anchoring his defense lines in bombed-out buildings that overlooked strategically important streets and squares, he ordered Soviet troops to "hug the enemy". Always keeping the front lines as close to the Germans as physically possible, often a mere floor or door frame away, he successfully negated much of the Germans' firepower and combined arms superiority. By October 1942, Stalingrad had become a matter of personal prestige for both Stalin and Hitler, and the sole focal point of the Campaign in the East, above and beyond any strategic military consideration. In mid-October, the Luftwaffe intensified its efforts against the remaining Red Army positions holding the west bank. Over 2,000 sorties were flown on 14 October with 600 tons of bombs dropped by German Stukas. The same day, three infantry divisions and two Panzer divisions surrounded three important northern factories that centered the Soviet line. The 14th Panzer pushed forward and broke through. With the Tractor Factory nearly surrounded, the intensity of the attack effectively split the Soviet 62nd Army in two. Knowing that the loss of the Tractor Factory would lead to the collapse of the Soviet's right flank, General von Paulus ordered fresh troops forward to dislodge the last Soviet troops entrenched there. 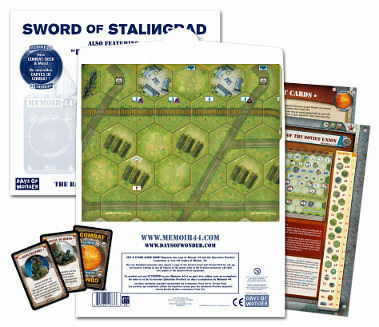 This Battle Map set also includes 2 Standard scenarios playable on a regular Memoir '44 board - Mamayev Kurgan and Pavlov, Hero of the Soviet Union; and Summary cards for the previously published Battle Maps and Mediterranean Theater. Also includes a revised Behind Enemy Lines Command card. New cards bring alot more cool possibilities to the game. All I can say is BUY IT!